In recent years a method known as lock snapping has become a widely used and common way for burglars to gain entry to a house. 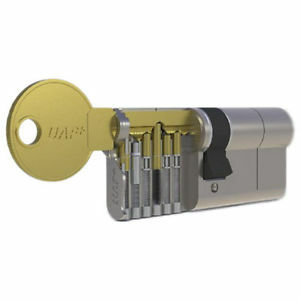 The term refers to a technique in which a specific type of lock cylinder is put under strain using regular tools to snap the lock. The locks vulnerable to this lock snapping technique are installed widely across the country. If you have not checked your cylinder locks at home or at work yet. It’s time to call a professional to ensure that your locks are not out of date. This check may even validate your home or business insurance policy. The out of date cylinder locks were installed on many properties before this weakness came to be known. Today, the standard cylinder lock is of an anti snap variety. The weak point which snapped giving access to the inside of the lock has been replaced with deliberate weak points. The lock may be snapped with a large amount of force, but not in such a way that it provides the perpetrator with access to the lock or the door. If you would like to ensure that you none of the locks at your home is open to the lock snapping method. Get advice from a trained technician on the point. Feel free to give our lovely crew a call at any time. We can help you identify what type of locks you have installed. We can also advice on lock changes and of course perform quick and competitively priced lock changes. Never hesitate to call us if there is something you are wondering. It is our mission and promise to keep you and all our other customers as safe and secure as can possibly be. What is an anti pick lock? No doubt have you seen a lock being picked. If not in person, then definitely on television or online. But how does it work, and what does it mean when someone speaks about an anti pick lock. The standard lock operates by a number of pins which need to be lifted in order to turn the key. If you look closely at the keys shape you will be able to see for yourself. The peaks are the pin lifters. A lock such as this is picked using different tools than the key to press pin into the opening position. An anti pick lock denotes a lock which is designed to battle this. Often it’s done by a change in shape of the pins. Giving them a mushroom shape instead of the regular straight angle get’s any other tool than the key stuck inside the mechanism. And although there may be a need to change the lock afterwards. Your door remains securely locked even at the attempt of burglary by means of lockpicking. Our trained team of skilled lock installers always recommend an anti pick lock for our customers. It adds to the overall security and often, the high security anti pick varieties of locks. Also come with other high security features. Such as being anti bump, anti snap and anti drill locks. If you are locked out of door with a high security anti pick lock installed. Call the quick to act professionals here. Not only will your lockout situation be resolved quickly and without hassle. But you will be on your way with your day or evening as planned in no time at all. Whatever you do don’t try to bypass the lock yourself. As this can cause damage and lead to a locked door which will bring a higher cost for regained access. ← Do I need to hire a door locksmith specialist for my installation?